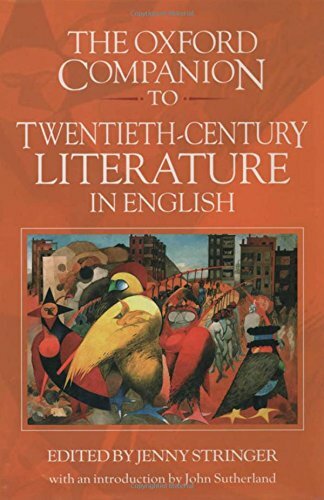 This is a unique new reference book to English-language writers and writing throughout the present century, in all major genres and from all around the world - from Joseph Conrad to Will Self, Virginia Woolf to David Mamet, Ezra Pound to Peter Carey, James Joyce to Amy Tan. The survivors of the Victorian age who feature in The Oxford Companion to Twentieth-Century Literature in English - writers such as Thomas Hardy, Olive Schreiner, Rabindranath Tagore, Henry James - could hardly have imagined how richly diverse `Literature in English' would become by the end of the century. Fiction, plays, poetry, and a whole range of non-fictional writing are celebrated in this informative, readable, and catholic reference book, which includes entries on literary movements, periodicals, and over 400 individual works, as well as articles on some 2,400 authors. All the great literary figures are included, whether American or Australian, British, Irish, or Indian, African or Canadian or Caribbean - among them Samuel Beckett, Edith Wharton, Patrick White, T. S. Eliot, Derek Walcott, D. H. Lawrence, Tennessee Williams, Vladimir Nabokov, Wole Soyinka, Sylvia Plath - as well as a wealth of less obviously canonical writers, from Anaïs Nin to L. M. Montgomery, Bob Dylan to Terry Pratchett. The book comes right up to date with contemporary figures such as Toni Morrison, Ben Okri, Salman Rushdie, Carol Shields, Tim Winton, Nadine Gordimer, Vikram Seth, Don Delillo, and many others. Title entries range from Aaron's Rod to The Zoo Story; topics from Angry Young Men, Bestsellers, and Concrete Poetry to Soap Opera, Vietnam Writing, and Westerns. A lively introduction by John Sutherland highlights the various and sometimes contradictory canons that have emerged over the century, and the increasingly international sources of writing in English which the Companion records. Catering for all literary tastes, this is the most comprehensive single-volume guide to modern (and postmodern) literature. Jenny Stringer is a freelance writer, and co-editor of The Concise Oxford Companion to English Literature. John Sutherland is Lord Northcliffe Professor of English Literature at the University of London.